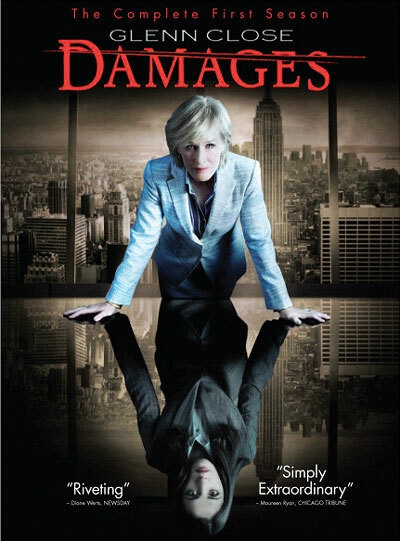 Damages sounded so good. It’d had great reviews in the States. It had an interesting cast. It had won all these nominations and awards. And it was one of the most disappointing series I’ve seen in a long time. What confuses me is that so many critics and viewers seem to bend over backwards to praise this series. “Riveting”? “Simply extraordinary”? Sure, these are just soundbites, but the longer reviews and especially the nominations (Emmys: Best Dramatic Series)… I just don’t get them. To begin with, there simply isn’t enough material for a full season. Had this been a six-episode miniseries, it may have been riveting, but as it was in progressed in fits and starts in between long periods of not going anywhere. I wouldn’t mind if the downtime had been used to develop the characters, but with most of them what you know at the end of episode 1 is pretty much what you know by the end of the season. The only difference is one of degree: we’re quickly aware that Patty Hewes (played competently by Glenn Close) is willing to have animals killed to get what she wants, so there simply isn’t that much of a surprise in learning that she’s willing to have people killed. The only characters that truly seem to develop are Ellie (although with her it takes until the last two to three episodes) and the defense attorney Ray Fiske, both of whom have actual character arcs. The other thing, which is closely related is this: if a series over-relies on twists and turns they pretty much lose all their effectiveness. This happens fairly quickly in Damages; every so often, you’re asked to re-examine a character or a scene and ask yourself, “So, did this really happen as I believe it did?” Which is all fine and dandy, but the problem is that we quickly learn not to trust anything, and at that point I stop being involved. I don’t invest in the characters or in what I’ve seen because chances are things’ll be different one or two episodes down the line. And at that point, nothing that happens in the series matters. Why be surprised at a character turning out to be evil when you knew that you’d be naive to believe that character to be good? If everything twists and turns, everything becomes arbitrary. Last but definitely not least: very few of the characters were interesting to begin with. Even a static character can be fun to watch, but almost everyone in the series felt generic. There simply wasn’t enough to Glenn Close’s Lady Macbeth-a-like Patty Hewes to make her different from similar manipulative characters. Same goes for Ted Danson’s Arthur Frobisher, one of the main bad guys in the series (although I found his uncanny, involuntary Christopher Walken impersonation at the beginning quite fascinating for an hour or so). While I’m usually a fan of unconventional chronology in stories, it didn’t help or change much in Damages: it had the effect of making audiences wonder, “Okay, how do we get from point A to point B?” But sadly, the answer to that always seemed to be the same: Patty does something manipulative and underhand. Frobisher’s people do something manipulative and underhand. Ellie falls for it. Rinse and repeat. So, since I don’t want to go on much longer about why I didn’t like (or didn’t get) Damages, I’ll just ask: is there anyone reading this who can tell me why I missed the point and that the series is actually clever/subversive/exciting in ways that I’ve failed to see? Because I do find it somewhat disconcerting that my opinion on Damages is shared by very few people out there, it seems.